Sky painting experiments continue with this painting. As with the last post, the sky was a non-standard format and suited this scene of Altamont Gardens. The object of the exercise was to have a ‘random shapes’ sky which is how we see sky and clouds in photographs. These gardens (a few miles south of me in County Carlow) have a wonderful collection of exotic old trees and shrubs and the landscape does not at all look like the normal Irish countryside. So this is why it suits this ‘sky experiment’. The colours were a limited palette of Burnt Sienna (red), Yellow Ochre and Prussian Blue. I thought I would need a strong green so I included Viridian Green on the palette, but I think I didn’t use any, as far as I can tell. Anyway, I would be very wary of using a lot of this green without a strong red to counteract it. The video of the painting process will be in the next post, see you then. 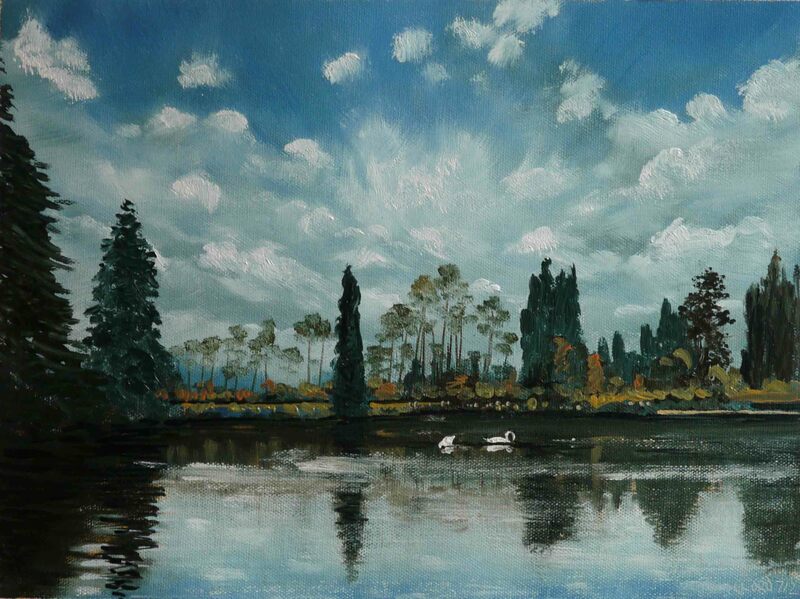 This entry was posted in Oil Painting and tagged Art, Clouds, Culture, Education, Inspiration, Irish landscape, lake, Oil Painting, Oil Painting Instruction, Oil Painting Landscape, painting, Pictures, Sky, swan, Time lapse painting, Trees, Water. Bookmark the permalink. Perhaps I should send you some photos of clouds here. I see some fantastic cloud formations and colors here in the western United States, and I often wonder if I were to paint these, would people think I made up the colors and formations? Amazing…only three colours!…This reminds me to keep things less complicated and focus on the getting the right info, values and feeling of the scene at hand. Thanks. I’ve been trying watercolors lately and working on sky exercises. It always amazes me how much of a difference the sky makes to the rest of the painting composition and how often it can be overlooked. I really like the movement in the sky in your painting able. And the sky usually occupies such a large area of the painting it deserves more attention. Here in Kentucky USA we have some gorgeous sunsets and sunrises. I remember as a kid laying on the grass and making shapes out of the clouds. It is a rare thing these days. The skies are so different now.Your painting is amazing and I love the way the clouds seem to spread out in ray like form. Thanks. We did the same as children. Now its difficult not to have ‘funny’ shapes in the painting of the clouds. I love the Swans. One, because they are like reflections of clouds on the water and two, because they are not noticed right away. My eye goes to the sky with its brilliant cloud movement then down to the water for that caprice. Lovely. Thank you for the nice comment Pierr. I’m delighted you liked.